How quickly will 15gb be used with 5G speeds, for $70 a month. I guess they want to regress again to tiered data like VZ did when they launched LTE. Proof once again that the only thing that stands between us and AT&T giving us the shaft ala Canada is competition. Don’t cheap out on your cables!!! I have not seen anything about what speed the service is offering. It doesn't really matter much for one user. About the most data speed that people use is streaming video. 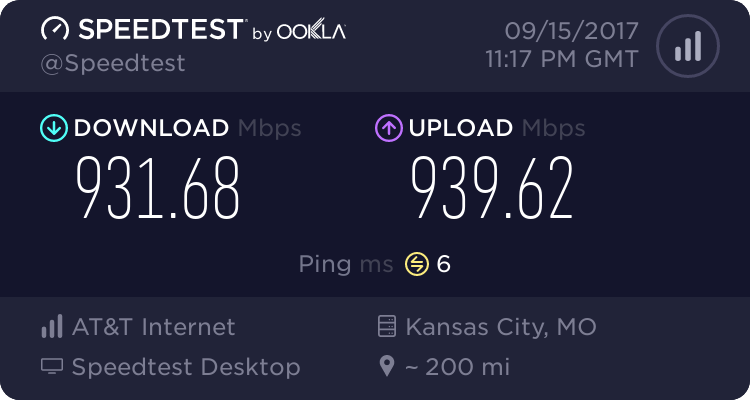 That only takes 4-5 Mbps. It's a start, but this initial offering of data amount and price does not impress me. Things will get interesting as the technology becomes widespread. I already have an unlimited hotspot. It is sweet. FESTUS, MO is one of those Test Cities! This is ridiculous. There’s no reason to cap data usage on millimeter wave, unless we’re talking about terabytes. Backhaul for all that data isn't free. Terabytes is probably what AT&T is thinking about. That is what some people will use if you let them. I expect prices will sort out to much lower as the market develops with competitors. Backhaul for all that data isn't free. Terabytes is probably what AT&T is thinking about. That is what some people will use if you let them. I expect prices will sorted out to much lower as the market develops with competitors. Verizon 5G-NR has no data caps though and it’s meant for that type of high use case. Maybe AT&T’s 5G-NR is being deployed on less bandwidth than VZ? When will we be able to buy the new 5G netgear ? I think I saw somewhere 12/21/18 and I think the price is $500. No thanks. I'm glad ATT is doing this, we don't want a repeat of 20... oh yeah. It never happened where the entire internet came crashing down because someone used more data. Not the entire Internet, but it certainly does happen quite regularly on oversubscribed/overused services. If I try to use the Internet on my Verizon phone near the University during evening Prime Time the Internet is effectively dead with a data speed of 0.5 Mbps or less. I believe this is also common in urban office blocks at lunchtime. More infrastructure is needed for more capacity. AT&T seems to be saying they don't have it yet. AllTel testing 7pm Nights & weekends in Select Markets???!!! When AT&T rolls out W-CDMA in 4 Markets how will they test the market ?